Now that we got something that resembles summer even here in the UK it can be a bit too hot to cook in the evenings. My answer to that is quite often to go for a Scandinavian style open sandwich of some kind. As those go, meatball and beetroot-salad ones are quite high up there when it comes to being classic. You could go the whole way and roast your own beets as well as make your own meatballs but it is summer - give yourself some time off and use some pre-made stuff for once. If you can find Scan's pre-made meatballs in your shop, they're the ones to go for. They are the classic ones, the ones that all Swedes now exactly how they taste. The quick tip is to fry them quickly so that they get a little bit of extra texture. That actually gives them quite a bit of extra flavour. The beetroot salad works really well as a side salad for when you have grilled or fried meats as well. Thoroughly mix the mayonnaise, creme fraiche, beetroot and apple together. Season well and give it a taste, if you think it's too sweet - add some lemon juice. Put the bowl with the beetroot salad in the fridge for as long as you can, at least an hour, to let the flavours mix. To assemble the sandwiches remove the beetroot salad from the fridge and let it come to room temperature. 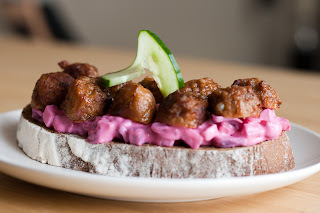 Put some beetroot salad on a slice of bread, top with meatballs. Wow, that is sooo pretty! Thanks so much for the recipe. I lived in Sweden a few years ago.. and i loved this sandwich, but was unsure how to recreate it !! Where from in Sweden are you from ? No problems at all. I do hope that you like it. It's my interpretation of what I remember from home so it might not be exactly what you used to eat. However, it can be a good start on the road to find what you're after. Whereabouts in Sweden did you live? I'm from the West Coast originally. From a small place not too far from Gothenburg. Cool, I know where that is. Did you work or study there. worked at ringhals 1997 for 6 months... loved it, gorgeous place Halland..
Not a bad neck of the woods, Halland. Almost always close to the ocean and quite a lot of nice woods in the inland too. Do you have any other dishes that you remember that I might be able to try and recreate for you? hehe glow in the dark !! wow thanks Mike.. for the kind offer !! I got a lovely dish made for me one night.. it was chicken breast, creamy potato... but the thing that made the dish was the sauce.. it was divine & I think it was lingon berry sauce.. that sauce I would love to be able to recreate ! Was the sauce a bit more 'firm' in the consistency? In that case it was probably lingonberry jam. I've never made that myself, nowadays mainly due to the fact that lingonberries are hard to get hold of here. However, if you can get hold of the berries, here's a fairly decent and authentic recipe I found. it was creamy.. if memory serves me right, he was whisking it with a small hand whisk. I wonder if there is a another fruit (easier to get hold of) that would give the same taste ? I will check out your link ! I have been looking thro some of your other recipes.. something u may enjoy.. is a good scottish recipe. called stovies.. this is our version of it..
You have yesterdays cooked potato left overs which u mash .. you fry a onion in a pan, then fry the tatties(potato in english ! )then you use cooked sausage & chop it thro the mix... delish !! !